Since I started my business, I've been collecting gorgeous lace and have now amassed a huge collection from all over the world. I continue to buy from the three remaining Nottingham lace manufacturers, and also have a gorgeous selection from Fewkes, who made lace for Princess Diana's wedding, but are now sadly closed. 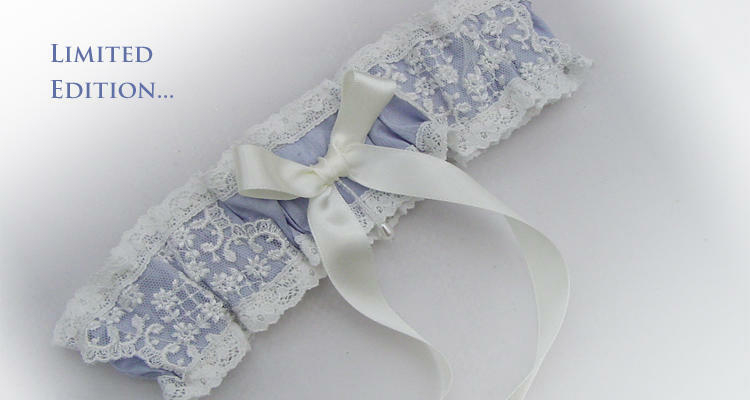 Garters made from Fewkes lace are 'Limited Edition', once this lace is gone it cannot be repeated. Type 'Fewkes' into the search box. Weft describes the threads used in the shuttle travelling across the width of the cloth. Warp describes the threads used in the length of the fabric. In Satin fabric, instead of warp and weft being woven alternately, longer float threads will be woven over several warp or weft threads. The longer float threads, give a smoother finish that catches the light. If your garter is made of pure silk it will say 'pure silk' in the description. 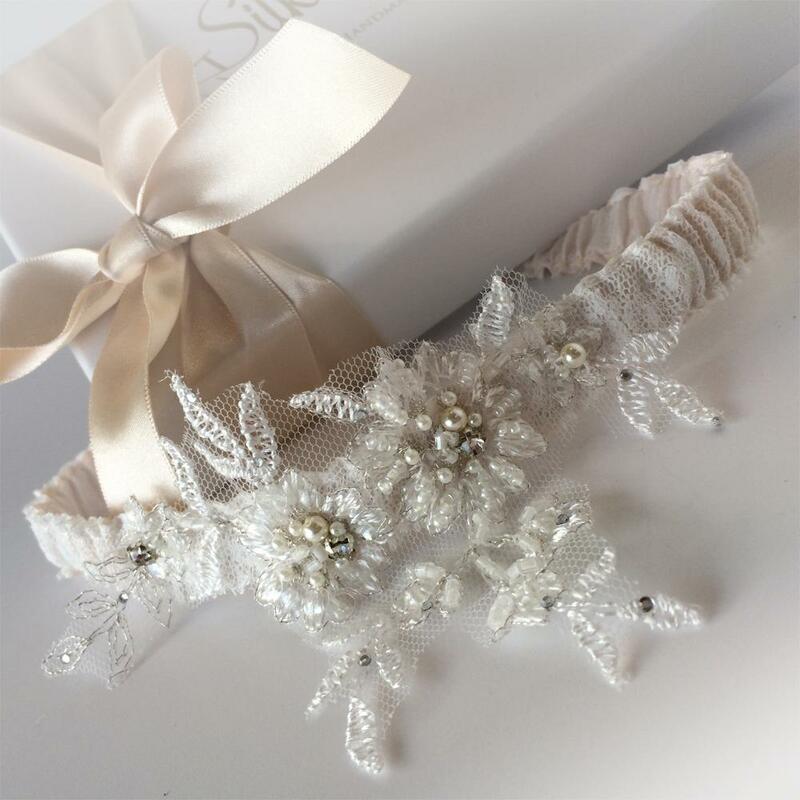 With some of the personalised garters, where your garter is being made to order, you are given the choice between poly satin, pure silk satin and pure silk dupion. Most of my garters in this price range are made of an organza ribbon or a top quality poly satin (although there are a few great value pure silks in this price range too!). The poly satin is made in the UK by a company that also supplies Marks and Spencer. Pure silk needs no introduction. It has been the ultimate in luxury fabric for hundreds of years. 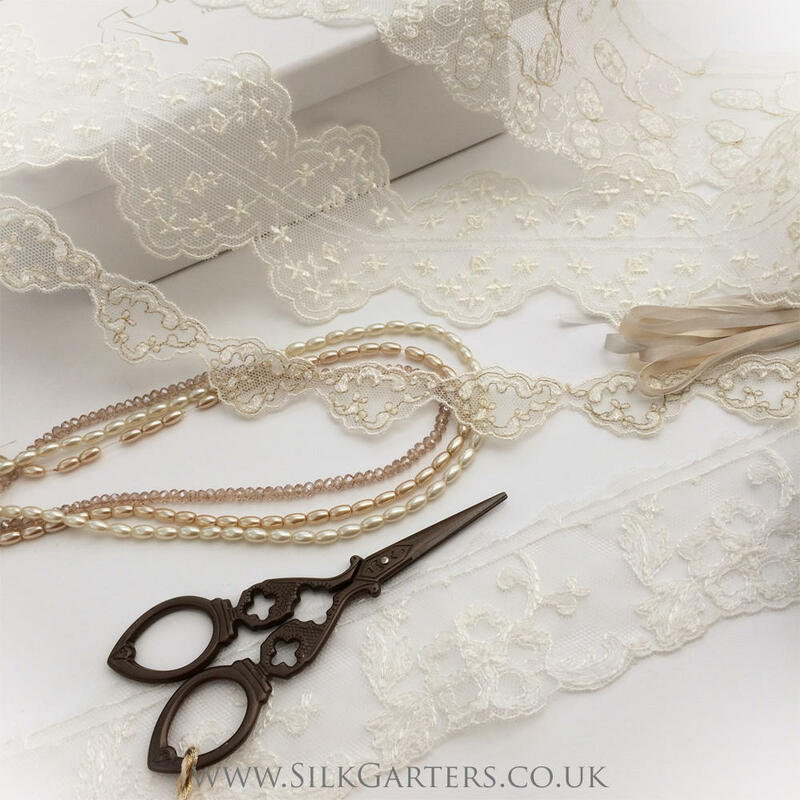 My pure silk satin is a good quality, 112gms, crepe back lingerie satin, which gathers beautifully on a bridal garter and is so soft and delicate to the touch. 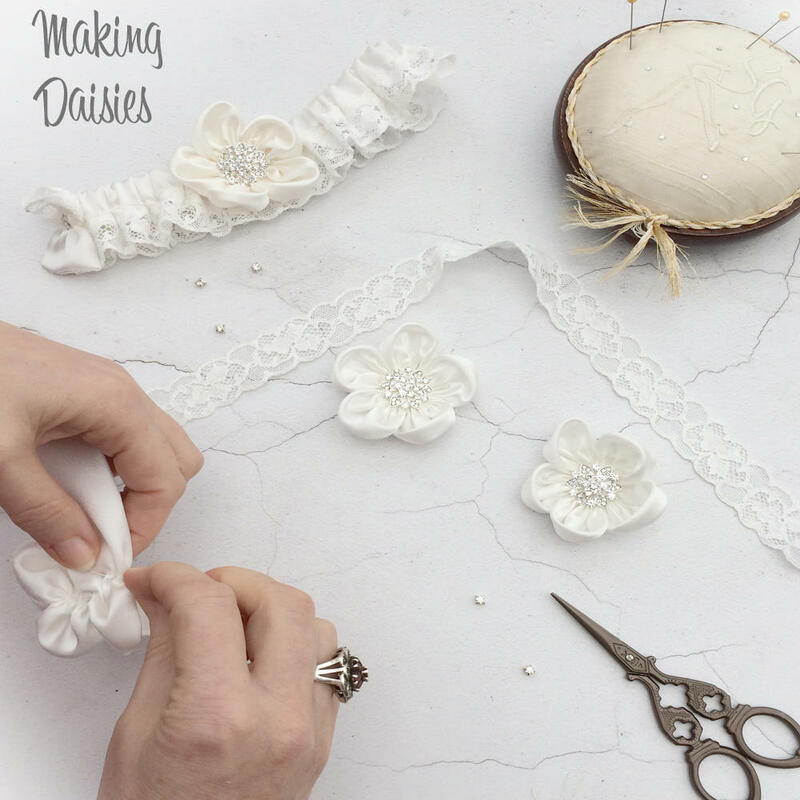 Being delicate though, it is more likely to crush and all our handmade 'silk daisy' garters come on a deep luxury gift box as standard, to keep the lovely curve in the petals. 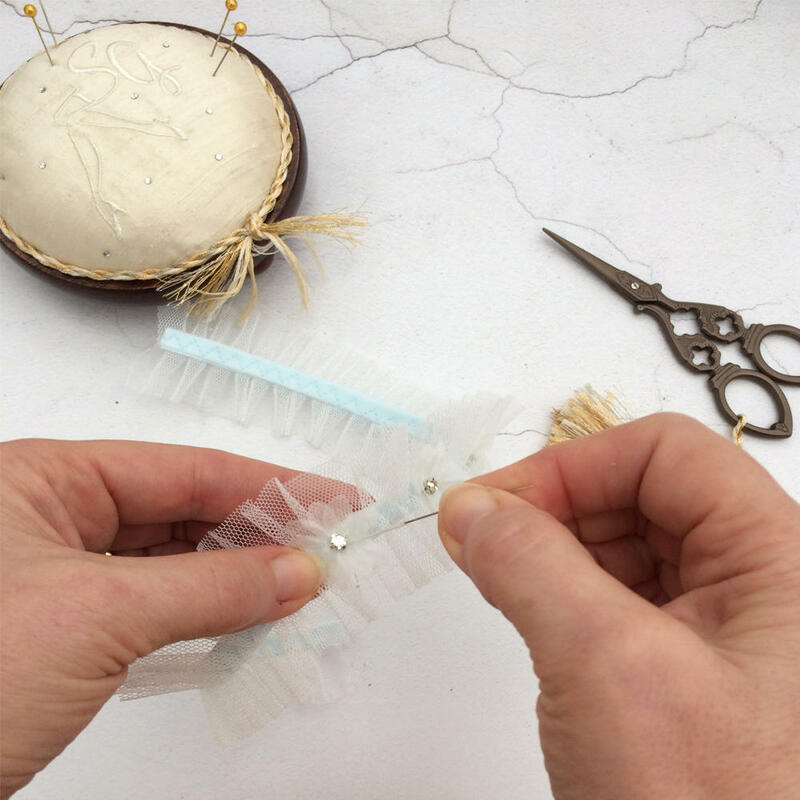 After your wedding, you can place it back in its box of tissue, as an heirloom, to save for the future and pass on to a new bride for their something borrowed. Handwoven = has a slubby appearance, this isn't a fault...it's just made the same way it would have been made for hundreds of years. Power woven = has a much smoother finish, made on new hi-tech powerful machines. Shot silk dupion = when the warp and weft threads are different colours, e.g. pink and turquoise, the fabric will show pinker or more turquoise depending on how the fabric catches the light...beautiful.